Overview: 6 mile hike, mostly flat and almost completely shaded on the ridgeline of the Santa Cruz Mountains. 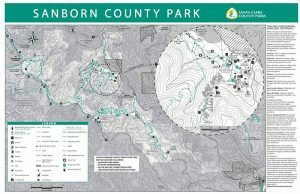 Dogs on leashes are allowed in Sanborn County Park. Getting there: Head West on Highway 9 towards Skyline Blvd (Hwy 35). Turn left at the junction with Skyline Blvd and drive 4.7 miles. Turn left into the Sunnyvale Mountain trailhead parking lot. 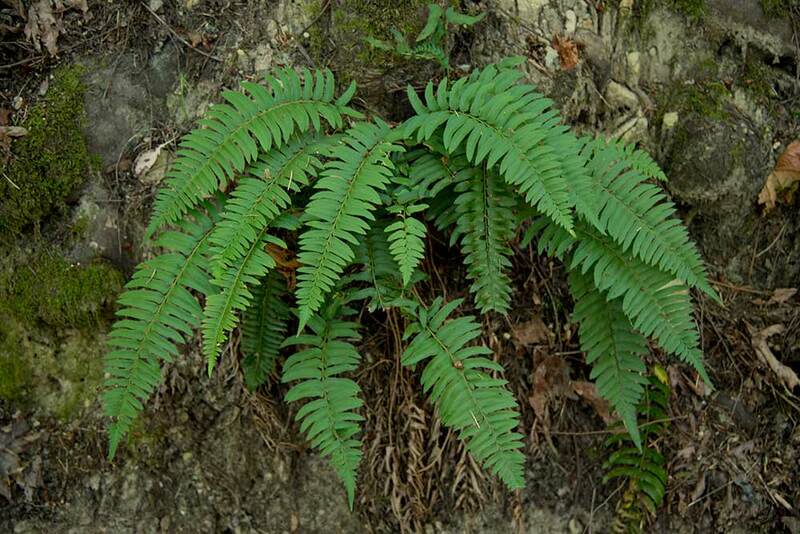 You know you’re in a good spot on a hot day when you’re hiking near western sword fern, a shade loving native. 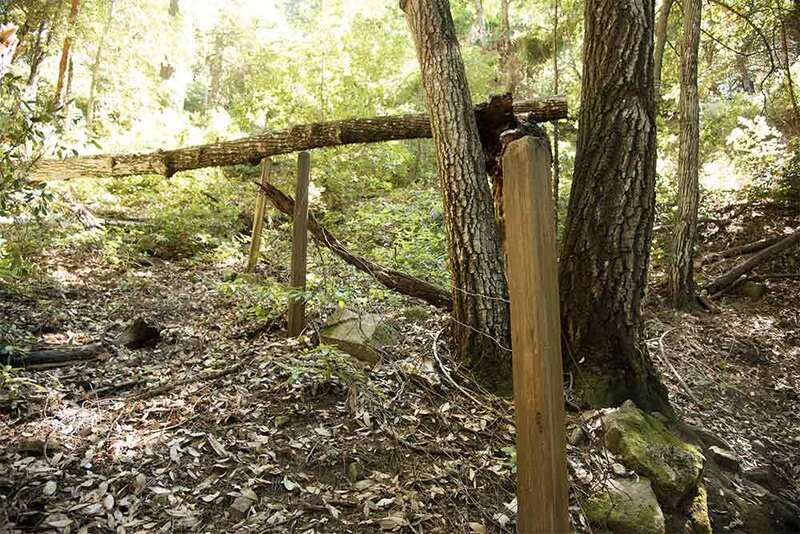 A mile down the trail you’ll come across these old fence posts that were used to mark the property boundaries between parcels before the land was protected by Santa Clara County Parks in the late 70s. This portion of the Skyline Trail meanders through towering old growth Douglas fir and Pacific madrone, making it an ideal spot for a hot summer’s day. Hot day? Looking to escape the heat, but still want to get outside for a hike? This 6 mile out-and-back hike on the top of Skyline Ridge is the perfect place to go. The trail meanders through dense forest and is almost completely shaded, making it the ideal place to escape on that hot summer day. From the parking lot at Sunnyvale Mountain Trailhead, walk north from the gate on the Skyline Trail. The trail starts on an old ranch road and after a few feet you’ll come to your first junction. Make sure to stay left and continue slightly uphill on the Skyline Trail. You’ll be on this trail for the entire hike and the other junctions you’ll come to are well marked. 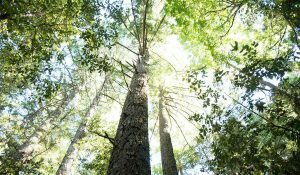 About a 100 yards from the trailhead the trail narrows and you’ll enter a thick forest canopy of Douglas fir, madrone, tanoak and big leaf maple. Keep your eyes peeled for summer wildflowers in the understory. A little further down, the trail winds away from the road and briefly cuts through a patch of coyote bush and blue elderberry. You’ll find yourself exposed to the sun for moment, but will quickly descend back into the cool forest cover. That’s the only part of the trail where you’re exposed to the sun. There’s a great picnic spot near some big sandstone boulders about a mile down the trail. It will probably be too early for lunch at that point, but this could be a good place to stop on your way back. Further down the trail, old growth Douglas fir and Pacific madrone surround the trail on both sides. While you’re always close to Skyline Boulevard, you don’t feel close to the road and traffic noise is minimal. Listen closely for sounds of summer song birds and resident acorn woodpeckers. Just a pinch over the 3 mile mark, you’ll see a huge sandstone boulder and a parking lot to your left. If you have time, climb the .2 miles up to Indian Rock where there’s a great picnic spot and you can watch rock climbers scale the rock’s steep face. When you’re ready, follow the trail back to the parking lot. Do you have some other favorite hikes for a hot summer’s day? We’d love to hear about them! Send us a note in the comments section. 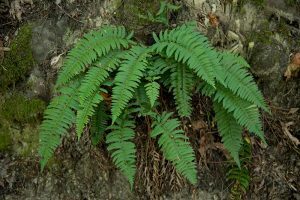 In 1985, POST protected 117 acres near Sanborn County Park and soon after transferred that land to Santa Clara County Parks for permanent management and protection. 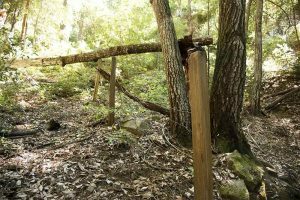 POST also holds a 15-acre conservation easement on a property adjacent to the existing park.